Nice! Can anyone read if there is any interesting info regarding the skill tree system? Other than Observation Haki and Armament Haki skills, there are other convenient skills you can choose to become stronger. Pretty much says you can choose whatever skills you want to become stronger and defeat enemies and play the game with the freedom you want. The actual pictures themselves are way too small to make out anything. The collector's edition is up for preorder at 160€, quite a steal. I'd like to know if the devil fruit is the Bandai one, the Banpresto one or a new item. We had already started developing [the game] before the Switch came out. We already have our hands full developing just for PS4, Xbox One, and Steam that have already been announced. We’ll see what the fans say, and then think about Switch. I still am kinda surprised that this is a mostly WG-themed rogues gallery for the game. Maybe there will be a Big Mom invasion DLC pack? I dunno. The fluidity of the animation when Luffy fought Isaac looked great. I'm getting excited about the potential depth of the skill tree and higher levels of combat they're giving us a glimpse of. Greg gave his impressions of the Jump Festa demo. Really liking the opening cinematic, and hope the version with the actual song somehow makes it to outside of Japan. Too bad I feel the marketing sort of decreased the hype towards this game. Maybe they rushed and announced it too soon? Anyway, looking forward to the final product, the bits and pieces revealed from the story so far are entertaining, they feel tightly constructed like a movie, way better than the previous game by Gambarion (Unlimited world Red). In all honesty, I think they should continue this pathway in the upcoming OP titles, which fits One Piece way better than brawlers or hack n' slash games. 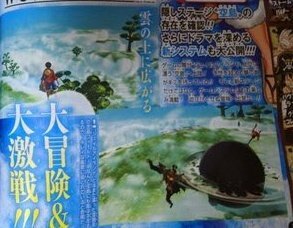 There is Sky Island in One Piece: World Seeker ! Hopefully a scan leaks soon then. Three months away, going to pre-order this game by the end of next month. Looks good so far. 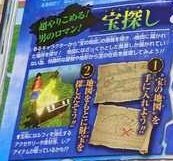 Sky island, Pirate karma and treasure maps. Hope this game turns out to be good, i'll buy it either way just to support one piece video games. I wonder how big is the map gonna be, is it like with Legend of Zelda: Breath of the Wild or Assassin's Creed Odyssey? Hopefully we get higher quality scans later.